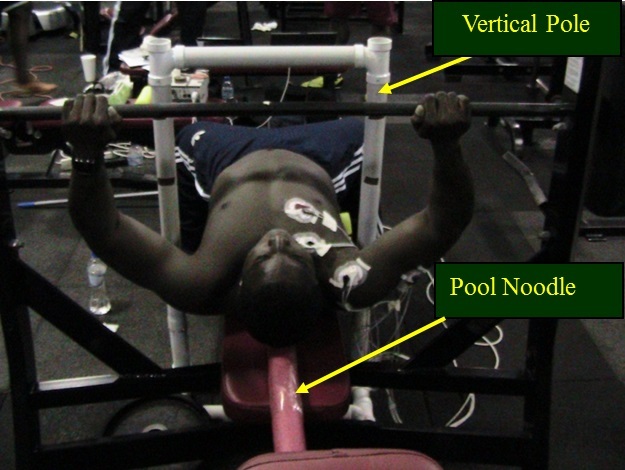 An Investigation of the Effects of Frontal Plane Glenohumeral Joint Angle, Scapular Mobility and Lower-Back Orientation of the Horizontal Bench Press on Electromyographic Activity of Four Muscles for Male Subjects. The purpose of this study was to determine the effects of frontal plane glenohumeral joint abduction (GHJA), scapular mobility and lower-back orientation of the horizontal bench press (HBP) on electromyographic activity of the upper clavicular and lower sternocostal heads of the pectoralis major (UCPM and LSPM), anterior deltoid (AD) and lateral head of triceps brachii (TB). Fourteen male subjects, with at least two years weight-training experience, volunteered for this study and signed informed consent forms prior to testing. Filtered EMG signals were full-wave rectified, integrated, and time normalized (EMG activity/time taken for concentric phase of lift) and expressed as a percentage of maximum mean integrated EMG (%MmIEMG) for each muscle. Repeated-measures ANOVA recorded overall differences in %MmIEMG between six exercise positions for each muscle with α level of 0.05. No significant differences in EMG activity were found in frontal plane GHJA, scapular mobility or lower-back position for anisometric measurements of the UCPM and LSPM and the lateral head of triceps brachii. Significant difference in EMG activity of the anterior deltoid was found for change in frontal plane GHJA from 70° to 90° (P = 0.046) and from 50° to 90° (P = 0.027) (fatigue screen applied) (with the 70º and 50° GHJAs producing greater activity than the 90°). This significant change in muscle fiber recruitment of the anterior deltoid from the 70º to 90º GHJA, together with the results of no significant changes in %MmIEMG activity of the UCPM, LSPM and lateral head of triceps brachii can aid in outlining specific techniques that can be employed by powerlifters, bodybuilders and fitness enthusiasts when performing the HBP. Keywords: bench press, surface electromyography, pectoralis major, fatigue index. The horizontal bench press (HBP) is a popular exercise used for developing upper body strength and power. Studies have investigated EMG activity of muscles involved in the HBP with regard to performance (11, 23, 25, 28) and the effects of width of grip and trunk inclination (2, 8, 16, 22, 26). Others (14, 15, 17, 21, 24) have examined shoulder injury prevention for better performance of the bench press. In many sports, particularly football, bench press capacity is used as a performance measure (13) and is an important lift in competitive powerlifting. 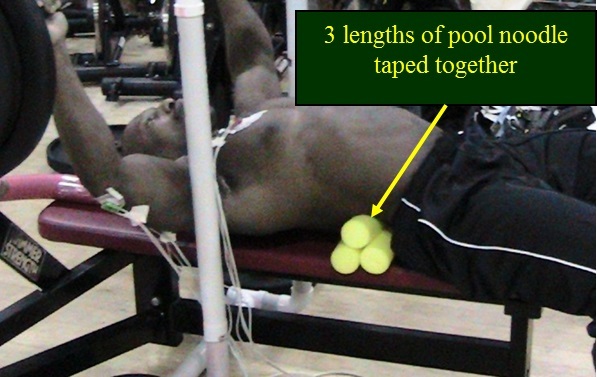 Due to incorrect technique, individuals are at risk from acute shoulder injuries involving a sudden traumatic episode, such as a rupture of the pectoralis major when performing the bench press (4, 18). The performance of the bench press may place the glenohumeral joint in a position approaching 90° of abduction, and the position may include some external rotation (17). Ninety degrees of abduction combined with end-range external rotation has been defined as the “at-risk position” that may increase the risk of shoulder injuries (17). A wider grip that is, 1.5 to 2 times the biacromial width, increases shoulder abduction above 75° (17). Clemons and Aaron (8) determined that when a wide grip (190% biacromial width) was used to perform the HBP, the EMG activity of the collective set of the prime movers (pectoralis major, anterior deltoid, triceps brachii and biceps brachii) was greatest. Lehman (22) found that for the HBP, moving from wide (200% biacromial width) to a narrower (100% biacromial width) grip width, increased EMG activity of the triceps and decreased activity of the sternocostal portion of the pectoralis major. Barnett et al. (2) indicated that a narrow grip produced more activity in the long head of the triceps brachii than a wide grip. Power-lifters effectively utilize the wide grip bench press for maximizing power out of the bottom of the bench press, and a positive by product is a muscular chest (3). However, some powerlifting coaches recommend tucking in the elbows to alleviate strain in the shoulder complex (13). It is possible that the decrease in abduction of the upper arm prevents the humerus from hyper-extending and flexing during the eccentric and concentric phases of the HBP. It is hypothesized that frontal plane glenohumeral joint abduction (GHJA) can affect motor unit recruitment of the prime movers of the bench press. Performing the bench press on a flat bench surface can cause injury to the shoulder as described by Larsen (21). A flat bench surface restricts movement of the scapula. At the shoulder joint, the ‘ball’ is forced to move to the end of its range in the ‘socket’. The scapula is unable to retract on the latter part of the down phase, as the elbow moves past the point of the shoulder. The humerus is horizontally hyper-extending. It is unable to protract with the latter part of the up phase as the elbow moves to the ceiling. Thus, the humerus is horizontally hyper-flexing (21). Larsen (21) recommended using a “pool noodle” to elevate the spine, thereby creating space for maintaining good scapula-humeral rhythm for performance of the bench press. This apparatus may work well for recreational lifters, bodybuilders and fitness enthusiasts but will not work for competitive powerlifters who are required to perform the bench press on a flat surface. By using this simple apparatus, scapula mobility is altered and it is very possible that shoulder injury may be prevented. It is hypothesized that the effect of scapula mobility on motor unit recruitment of the prime movers of the HBP may also be affected. When performing the HBP most of the body’s stability and a degree of pushing power comes from the legs (19). Mechanical leverage is also maximized by arching of the back. This is accomplished by bringing the shoulders as close as possible to the hips without allowing the buttocks to rise off the bench surface (27). Arching the back also decreases the distance that the bar must travel during the bench press (19). In addition to arching the lower back, a thick chest and short arms also helps powerlifters to lift greater loads (20). It is postulated that lower-back orientation can affect motor unit recruitment of the prime movers of the HBP. Owing to the several variations of how the HBP can be performed and the associated risk of injury to the shoulder complex, a greater understanding of how variations of the HBP can affect motor unit recruitment is needed. The purpose of the study was to determine the effects of frontal plane GHJA, scapula mobility and lower-back orientation on activation levels of the upper clavicular (UCPM) and lower sternocostal (LSPM) heads of the pectoralis major, anterior deltoid (AD) and lateral head of triceps brachii (TB). The quantitative experimental method of research was employed for this study. Many athletes use a variety of GHJAs and lower-back positions to either maximize weight lifted or muscle fibers recruited of the pectorals. This study was focused on maximizing EMG activity and hence muscle fiber recruitment of the pectoralis major. Also, many benches for the HBP are designed with flat surfaces that do not allow for free movement of the scapula. The effect of most benches is to restrict the movement of the scapula, thereby artificially exaggerating the movement of the humerus in the gleno-humeral joint (21). Therefore, interventions were made for GHJA, lower-back orientation and scapula mobility, which gave three independent variables. The effect of these three independent variables on the dependent variable (EMG activity) of the UCPM, LSPM, AD and TB were examined. Three GHJA positions of 50º, 70º and 90º in the frontal plane were used to investigate the effect of GHJA on EMG activity of the prime movers of the HBP. Fixed variables were lower-back position and scapular mobility. Lower-back position was kept in a naturally arched position (LBNA). LBNA was defined as the position where the subject’s lower-back felt comfortable when lying in position to perform the HBP. A pool noodle, a floatation device used at many swimming pools, was used to control scapula mobility. The pool noodle was placed parallel to the length of the bench at mid-width. Subjects were required to lie supine on the bench with the spine resting on the pool noodle. This allowed the scapulae to retract more when compared to using a flat bench surface to perform the HBP. The scapular position was controlled for by using the scapula-released (SR) position (use of pool noodle) and scapular-neutral (SN) position (where the scapula is restricted on a flat bench surface) in order to investigate the effect of scapular mobility on EMG activity of the prime movers of the HBP. The SN position was simply defined as the position where the upper back rests flat on the bench without the pool noodle. For this case, GHJA was fixed at 70º with the LBNA position. Figure 1 below depicts the placement of the pool noodle relative to the subject and the bench. Figure 1. Position of pool noodle and vertical poles placed relative to bench and subject. With the lower back and scapula position fixed, the effect of GHJA on EMG activity of the prime movers of the HBP could be examined. GHJAs of 50º, 70º and 90º were measured using a goniometer and maintained throughout the concentric phase of the lift by placing two vertical wooden/pvc poles medial to the upper arm or humerus. Once the upper arm remained in contact with the poles, specific GHJAs of 50º, 70º and 90º in the frontal plane were maintained. The three positions of LBNA, lower-back arched (LBA) and lower-back flat (LBF) were used to investigate the effect of lower-back position on EMG activity of the prime movers of the HBP. A pool noodle or rolled towel was used to produce an unnatural arch or the LBA position in the lower back as depicted in Figure 2 below. Figure 2. Three lengths of pool noodle used to produce the lower back arched (LBA) position. The LBA position is a common position used by powerlifters. The LBF position was created by lifting the legs of the ground where the thighs were approximately perpendicular to the horizontal bench surface as shown in Figure 3. Figure 3. Subject with legs lifted to produce the lower-back flat (LBF) position. The feet can also be placed on a high box to create the LBF position. The SR position with a GHJA of 50º was used for this test. Table 1 below illustrates the six positions examined. Table 1: The six pre-determined bench press positions examined for effects of change in frontal plane GHJA, scapular mobility, and lower-back positions on EMG activity of UCPM, LSPM, anterior deltoid and lateral head of triceps brachii. Before any recruitment and testing of subjects was undertaken, an online tutorial for the tri-council policy statement was completed to ensure that the investigator was aware of ethical issues to be considered during testing. This was a requirement of the research ethics board (REB) at The University of British Columbia (UBC). Approval to proceed with testing was obtained from the REB at UBC and the institutional review board (IRB) at the University of Trinidad and Tobago (UTT). It was essential that subjects were not coerced into volunteering for testing. A poster advertising the research to be undertaken was constructed and placed at the “Bird Coop”, a gymnasium located at the UBC. Advertising was also done at local gyms in Trinidad. The gymnasium seemed to provide an excellent source for obtaining subjects since its members were athletes and fitness enthusiasts who regularly performed the HBP. A convenience sample was used for this study. Female subjects were not selected for the study because adipose breast tissue can attenuate the EMG signal from the pectoralis major and can adversely affect results. Fourteen males with a minimum of two years weight training experience were recruited for this study. Participation was voluntary and without remuneration. All subjects were required to sign an informed consent document prior to testing. Physical characteristics of subjects are depicted below in Table 2. Table 2: Physical characteristics of participants. One week prior to testing, subjects were required to determine their one repetition maximum (1 RM) using the indirect method for the HBP for their selected position. They were then trained to maintain the six positions outlined above as well as to control the time taken for the lift. Approximately 3 to 5 seconds was expected for the concentric phase of the lift. Bouncing the weight off the chest was not allowed. The investigator ensured that complete repetitions were made by observing an approximate “lock out” of the elbow at the top position of the lift. The GHJA was measured using a goniometer and the subject was aided in keeping this angle by placing two fixed vertical supports that contacted the medial part of the upper arm. When subjects were not making contact with the support, they were aware that the angle was not maintained and the lift was recorded as failed. Height, weight and age were also recorded. Width of grip was standardized by letting the subject hold a wooden pole in both hands at the lowest position of the bench press where the bar touches the chest. Hands were then moved until the forearms were perpendicular to the pole. The spacing between hands was then marked as the width of grip. This was done for all three GHJAs of 50º, 70º and 90º. When the forearms are perpendicular to the barbell at the lowest position, maximum force can be effectively applied upwards to the bar. On the day of testing, a sub-maximal load of 80% 1RM was used for each lift. This enabled subjects to perform the six required lifts. Participants were required to perform three trials for each position. Positions were randomized for every subject tested. Between trials, subjects were given three to five minutes of rest. This schedule was used to minimize the influence of fatigue. Velocity of the bar for the concentric phase of the lift was kept low (3 to 5 seconds for period of lift) to produce sufficiently stationary signals. For all subjects, prior to testing, the skin was prepared for placement of electrodes by shaving predetermined areas to remove hair. All sites were then cleaned with alcohol to improve contact of electrodes to the skin and decrease impedance. EMG activity was detected by pairs of one centimeter disc Ag/AgCl electrodes with inter-electrode distance of two centimeters. Bi-polar centers were placed on the surface of the skin by the researcher, over the muscle bellies on the right side of the body and were offset two centimeters from the mid-length of the muscles to avoid innervation zones. Taking attachment sites into consideration, points were marked at the sternoclavicular joint (point 1) and the lateral lip of the bicipital groove (point 2) as shown in Figure 4 below. A line was drawn to join these two points to aid in placement of electrodes. Bi-polar electrodes (self-adhesive and pre-gelled) were fixed to the skin at approximately two centimeters offset from the mid-length of this line. In addition, surgical tape was placed on electrodes and lead wires as a precaution to prevent movement of electrodes on the skin surface. Figure 4. Anatomical landmarks for determining bi-polar centers for placement of electrodes on the UCPM and LSPM and anterior deltoid. The sternocostal head of the pectoralis major has proximal attachment at the lateral aspects of the manubrium and body of the sternum, the upper six costal cartilages and the aponeurosis of the external abdominal oblique. The distal attachment for the LSPM is the same as the UCPM. Hence the common anatomical position for the LSPM and UCPM was point two as depicted in Figure 4. A third point was marked at the approximate sixth costal cartilage that forms the connection between the sixth rib and the sternum as depicted above in Figure 4. 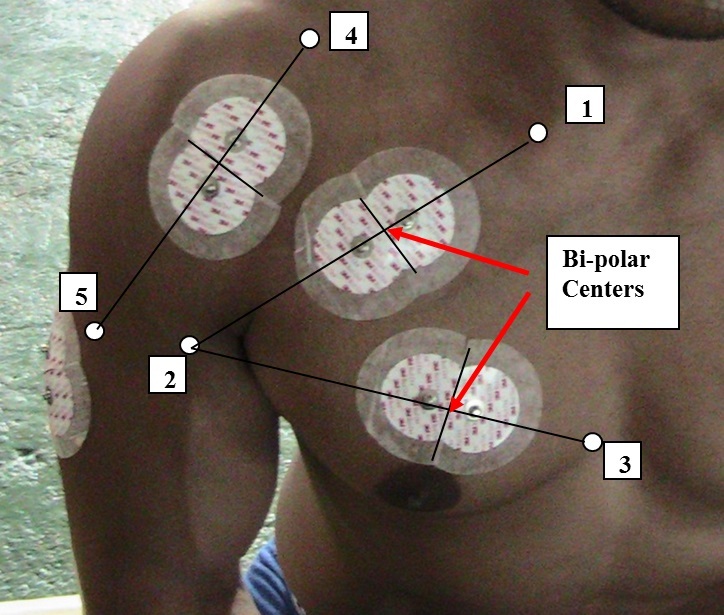 Similar procedure for location of bi-polar electrodes on the UCPM was used for the LSPM and is depicted in Figure 4. The anterior deltoid has its proximal attachment at the anterior border of the lateral third of the clavicle and a distal attachment at the deltoid tuberosity on the lateral surface of the proximal humeral shaft. Two landmarks, points four and five respectively (as depicted above in Figure 4) were located at the approximate mid-length of the lateral third of the clavicle and at the distal attachment at the deltoid tuberosity. Points four and five were then used to locate the bi-polar center for the anterior deltoid at approximately two centimeters offset from the mid-length of the line from points four and five. The lateral head of the triceps brachii has its proximal attachment at the superior half of the posterior surface of the humeral shaft, lateral to the spiral groove and a distal attachment at the posterior surface of the olecranon process of the ulna. These anatomical landmarks were not used to locate the bi-polar center for the lateral head of the triceps brachii. Instead, the electrodes bi-polar center was located at approximately two centimeters offset from the largest section of the muscle belly. 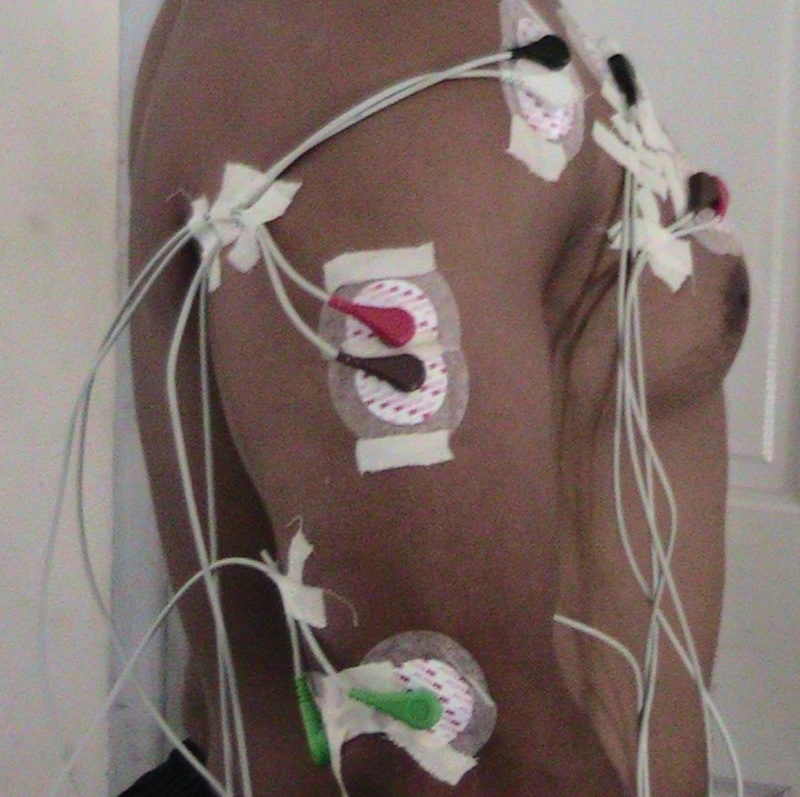 Figure 5 below illustrates placement of bi-polar electrodes on the lateral head of the triceps brachii. The ground electrodes were located at the skin surface above the lateral and medial epicondyles of the humerus with wire leads attached. Figure 5. Bi-polar electrodes on the lateral head of the triceps brachii with ground electrodes at the surface above the medial and lateral epicondyle. Two ML865 Power Lab 4/25T were used as data acquisition systems coupled by a common trigger recorded EMG activity. Signals were sampled at 1000 Hz for anisometric tests, filtered at 10 Hz (high pass) and 500 Hz (low pass). This was done in accordance with De Luca (10), who states that most of the useable energy of the signal is limited to the 0 to 500 Hz frequency range. Since the maximum frequency of the useable energy was 500 Hz, a sampling rate of 1000 Hz and above was suitable and adheres to the Nyquist theorem. According to the Nyquist criterion, the sampling frequency must be at least twice the maximum frequency component in the signal (5). EMG activity is a quantitative variable with units of Volts. SEMG activity is affected by electrode movement, placement, and physiological changes; therefore, all trials had to be performed on the same day before electrodes could be removed. Subjects were given three to five minutes of rest between trials to prevent muscle fatigue. The filtered EMG was full-wave rectified, integrated IEMG, and time normalized (found per second). The mean IEMG (mIEMG) of the UCPM, LSPM, AD and TB was determined for the three trials for each subject at the six predetermined HBP positions and expressed as a percentage of the maximum mIEMG (%MmIEMG). Recordings were processed for the concentric phase (from the lowest position to soft elbow lock out). Processing EMG activity for the whole concentric phase assisted in eliminating variance in readings by containing overall change in EMG activity, due to movement of electrodes for individual trials, constant. Although subjects were seemingly given sufficient rest between trials, the percentage decrease in mean power frequency (MPF) and the increase in IEMG were determined for the UCPM, LSPM, anterior deltoid and lateral head of triceps brachii for anisometric contractions from trials one to three. MPF was determined using the LabChart software with settings of upper and lower frequencies of 10 Hz and 500 Hz respectively with FFT size of 1024 (1K) and a Hann (cosine-bell) data window. Simultaneous occurrence of percentage decrease in MPF greater than ten percent and increase in IEMG was used as a fatigue index to screen the data. If simultaneous decrease in %MPF and increase in IEMG occurred for EMG signals of subject’s muscles from trials one to three, then those subjects were removed from the statistical pool and the data were reanalyzed. If there were differences in statistical analyses between unscreened and screened data it would then be possible to state that fatigue effects had affected results. A repeated-measures ANOVA or within-subjects ANOVA, was used to test overall differences in %MmIEMG between six exercise positions for each muscle. The dependent variable (EMG activity) was assumed to be normally distributed. By testing overall differences in %MmIEMG for the six exercise positions we were able to examine a fourth effect of position (six specific positions) together with the three main effects of GHJA in the frontal plane, lower-back position and scapular mobility. The assumption of sphericity for repeated-measures ANOVA assumes that the variances of the differences between all possible pairs of the independent variables (frontal plane GHJA, scapular mobility, lower-back position) are equal. Based on the assumption of sphericity, it was expected that measures of %MmIEMG should be correlated across subjects. If correlations for subjects across exercise positions were not similar, the assumption of sphericity was violated and the computed significance for the F-test is too low, resulting in wrongfully rejecting the null hypothesis. In SPSS, Mauchly’s test of sphericity provides for this. If the assumption of sphericity was violated, the output for the Greenhouse-Geisser correction factor was interpreted. The Bonferroni pair-wise comparisons were interpreted for significance. A probability level of p≤ 0.05 was used to identify significant differences in %MmIEMG activity between positions. A repeated-measures ANOVA for sphericity assumed, determined that %MmIEMG activity of the upper chest was not significantly different between the six HBP exercise positions (F(5, 65) = 1.788, P = 0.128). For the lower chest, a repeated-measures ANOVA with a Greenhouse-Geisser correction determined that %MmIEMG activity was not significantly different between HBP exercise positions (F(1.894, 65) = 2.084, P = 0.148). For the anterior deltoid, a repeated-measures ANOVA with a Greenhouse-Geisser correction determined that %MmIEMG activity differed significantly between exercise positions (F(2.654, 65) = 3.787, P = 0.023). Post-hoc test using the Bonferroni correction revealed that a change in frontal plane GHJA from 50º (position one – 50º, SR, LBNA) to 70º (position two – 70º, SR, LBNA) produced a reduction in mean %MmIEMG activity of the anterior deltoid for the HBP (89.85 ± 12.62% vs. 83.41 ± 11.81%, respectively) which was not significant (P = 1.0). However, %MmIEMG activity at a frontal plane GHJA of 90º (position three – 90º, SR, LBNA) of the anterior deltoid was reduced to 74.35 ± 14.31% which was significantly different (P = 0.046) to %MmIEMG at a frontal plane GHJA of 70º. Pairwise comparisons for lower-back positions of naturally arched (position one – 50º, SR, LBNA) and arched (position five – 50º, SR, LBA) produced a reduction in %MmIEMG of the anterior deltoid from 89.85 ± 12.61% to 82.93 ± 15.11%, respectively) which was not significantly different (P = 1.0). The flat-back position (position six – 50º, SR, LBF) for the anterior deltoid produced %MmIEMG activity of 91.40 ± 14.53% which was not significantly different at either the naturally arched position (P = 1.0) or the arched position (P = 0.414). For change in scapular mobility from released (SR) position (position two – 70º, SR, LBNA) to neutral (SN) position (position four -70º, SN, LBNA), %MmIEMG activity was reduced from 83.41 ± 11.81% to 81.04 ± 12.90% respectively, which was not significant (P = 1.0). Maximum %MmIEMG activity of 91.40 ± 14.53% was observed for position 6 (50º, SR, LBF) with a minimum value of 74.35 ± 14.31% at position three (90º, SR, LBNA). Maximum and minimum %MmIEMG activity for the UCPM, LSPM and anterior deltoid occurred at positions six and three respectively. A repeated-measures ANOVA with a Greenhouse-Geisser correction determined that %MmIEMG activity of the lateral head of the triceps brachii was not significantly different between exercise positions (F(2.44, 65) = 1.085, P = 0.360). Figure 6 illustrates the estimated marginal means of %MmIEMG for the UCPM and LSPM, AD and TB for fourteen subjects executing six exercise positions of the HBP. Figure 6. Mean %MmIEMG activity versus exercise position for the UCPM, LSPM, anterior deltoid and lateral head of triceps brachii of the HBP for anisometric contractions. Data were further examined to determine if any of the four muscles investigated had undergone fatigue. If any of the muscles investigated had undergone fatigue then results could have been adversely affected. According to Cifrek et al. (7), an increase in EMG amplitude and EMG spectrum shifting to the left is considered to be result of muscle fatigue. Using these characteristic changes in amplitude and frequency as a fatigue index, MPF and IEMG of the signals for the UCPM, LSPM, anterior deltoid and lateral head of triceps brachii were determined for the first and third trials for all six exercise positions. Average MPF and IEMG for the six positions were then determined for the first and third trials. Percentage change in average MPF of the signals from the first and third trials were calculated for all subjects tested under anisometric contraction. If decrease in average MPF was greater than ten percent for any of the signals of the four muscles investigated then change in average amplitude for the six positions were determined for these signals. Subjects ten to fourteen had percentage decrease in average MPF values greater than ten units. Average IEMG for the UCPM, LSPM, anterior deltoid and lateral head of triceps brachii had increased from trial one to trial three for subjects ten to fourteen, with exceptions of the LSPM for subject fourteen and the lateral head of triceps brachii for subjects eleven and twelve for which IEMG decreased. Based on the fatigue index of decreased average MPF and increased average IEMG from trials one to three, more than one muscle investigated had undergone fatigue for subjects ten to fourteen. Fatigue effects were then investigated by eliminating subjects ten to fourteen from the statistical pool. Data were then reanalyzed. A repeated-measures ANOVA was used to test overall differences in %MmIEMG between the six exercise positions for the UCPM and LSPM, anterior deltoid and lateral head of triceps brachii for the nine remaining subjects. A repeated-measures ANOVA for sphericity assumed, determined that %MmIEMG activity of the UCPM was not significantly different between the six HBP exercise positions (F(5, 40) = 1.502, P = 0.245) for anisometric contractions. For the LSPM, a repeated-measures ANOVA for sphericity assumed, determined that %MmIEMG activity was not significantly different between the six HBP exercise positions (F(5, 40) = 0.908, P = 0.423) for anisometric contractions. A repeated-measures ANOVA for sphericity, determined that %MmIEMG activity of the anterior deltoid differed significantly between HBP exercise positions (F(5, 40) = 15.456, P = 0.000). Post-hoc test using the Bonferroni correction revealed that change in frontal plane GHJA from 50º (position one – 50º, SR, LBNA) to 70º (position two – 70º, SR, LBNA) produced a reduction in mean %MmIEMG activity of the anterior deltoid for the HBP (90.16 ± 10.08% vs. 79.71 ± 12.35%, respectively) which was not significant (P = 0.095). However, %MmIEMG activity at frontal plane GHJA of 90º (position three – 90º, SR, LBNA) of the anterior deltoid was reduced to 72.02 ± 13.12% which was significantly different (P = 0.027) to %MmIEMG at frontal plane GHJA of 50º. Pairwise comparisons for lower-back positions of naturally arched (position one – 50º, SR, LBNA) and arched (position 5: 50º, SR, LBA) produced a reduction in %MmIEMG of the anterior deltoid from 90.16 ± 10.08% to 87.38 ± 12.83%, respectively) which was not significantly different (P = 1.0). The flat-back position (position six – 50º, SR, LBF) for the anterior deltoid produced %MmIEMG activity of 98.95 ± 2.19% which was not significantly different with neither the naturally arched position (P = 0.678) nor the arched position (P = 0.398). For change in scapular mobility from released (SR) position (position 2: 70º, SR, LBNA) to neutral (SN) position (position four -70º, SR, LBNA), %MmIEMG activity was reduced from 79.71 ± 12.35% to 78.81 ± 11.32% respectively, which was not significant (P = 1.0). Scapular mobility did not have any effect on %MmIEMG activity of the anterior deltoid for anisometric contractions. There was no significant difference in %MmIEMG for change in frontal plane GHJA, scapular mobility and lower-back position for the lateral head of the triceps brachii. Application of the fatigue screen produced no significant change in results for the UCPM, LSPM, and lateral head of triceps brachii with exception for the anterior deltoid. This implied that fatigue effects did not adversely affect results. Approximate times of lift varied from two to six seconds. Since period of lift was not constant, the EMG data were time normalized. This meant that the integrated EMG activity was calculated per unit of time. Longer periods of lift produced greater overall EMG activity than that for shorter periods of lift. This was not a problem since time normalization (EMG activity expressed per unit time) compensated for variations in times taken to complete the lift. However, this was a major delimitation in this study. The major objective of this study was to determine if specific positions would affect EMG activity of the prime movers of the HBP. Percentage MmIEMGs provided direct comparisons for comparing differences in EMG activity for the six positions. The mean IEMG was not expressed as a percentage of maximum voluntary isometric contraction (%MVIC) since MVIC would vary for each of the six positions under investigation. Secondly, there is no clear indication for when a subject is producing a maximum isometric contraction. Expressing mean IEMG as a %MVIC can introduce an unconfined variable that can adversely affect results. Repeated-measures ANOVA determined that %MmIEMG activity of the UCPM and LSPM and TB were not significantly different between exercise positions with respect to frontal plane GHJA, scapular mobility and lower-back position, for the HBP. Statistically, results implied that any of the six exercise positions, with respect to frontal plane GHJA, scapular mobility and lower-back positions, may be used for maximizing EMG activities of the upper and lower pectoralis major. The only significant differences in activation level (%MmIEMG) was found between GHJAs of 50° and 90° (P=0.027) (fatigue screen applied) and 70º and 90º (P=0.046) (without fatigue screen) for the anterior deltoid. This is an important finding, as it is a clear indicator of how much a lifter can emphasize or deemphasize the anterior deltoid when performing the HBP. With the upper arm at a 50° or 70º GHJA a lifter can maximize recruitment of the anterior deltoid, without affecting recruitment of the UCPM and LSPM. Greater EMG activity at the 50° and 70° GHJA could have been attributed to an overall shorter muscle length during the concentric phase of the lift compared to a longer muscle length at the 90° GHJA. Lower %MmIEMG at the 90 º GHJA could have been the result of lower motor unit recruitment or discharge rate. Christova et al. (6) found higher discharge rates for the majority of the biceps brachii motor units studied at shorter compared with longer muscle lengths (60° joint angle range), when torque was delivered at the same percentage of the MVIC torque obtained at each elbow angle. Of the six HBP positions examined for the UCPM, LSPM, lateral head of triceps brachii and anterior deltoid, maximum EMG activity varied between subjects. Maximum %MmIEMG of the UCPM occurred at position one for subjects 1, 8, 10 and 12, at position two for subject 7, at position four for subjects 2, 5 and 14, at position five for subjects 3 and 13 and at position six for subjects 4 and 9. A similar trend was observed for the other three prime movers of the HBP. This can be attributed to individual biomechanical, physiological and anatomical differences. However, what was quite interesting was that no subjects produced maximum EMG activity for the UCPM, LSPM and lateral head of triceps brachii at position three. Position three was defined at GHJA of 90° with scapula released and lower-back naturally arched. Only one subject produced maximum EMG activity at GHJA of 90°. Given these findings, further research is required to determine the actual mechanism that allowed subjects to produce lower EMG activity at the GHJA of 90°. Biomechanically, frontal plane GHJA of 90º appears to be more efficient than the 50° and 70° GHJA since it produced less EMG activity in the anterior deltoid. However, the 90° GHJA has been defined as the at-risk position by Green and Comfort (17). It is postulated that the shoulder joint complex (cartilage, ligaments and tendons) takes a greater share of the load than the anterior deltoid at the 90° GHJA. Based on the results, scapular mobility (SR and SN) had no effect on EMG activity of the UCPM, LSPM, AD and lateral head of TB. Hence, either the SR or SN position can be used to effectively target the UCPM and LSPM. However, according to Larsen (21), a flat bench surface does not allow for retraction and protraction of the scapulae and a pool noodle is recommended to alleviate this problem. By allowing for retraction during the eccentric phase and protraction during the concentric phase, the humeral head remains centered within the glenoid fossa during shoulder movement. According to Escamilla et al. (12), appropriate scapula muscle strength and balance is important because the scapula and humerus move together as a unit during humeral elevation, referred to as scapulohumeral rhythm. Recommendations by Larsen (21) stated that the HBP could be performed on a bench that allows more scapulae mobility without affecting muscle fiber recruitment and possibly prevent shoulder injury. For lower-back position, no significant difference in %MmIEMG was determined for the UCPM and LSPM, AD and lateral head of TB. Based on these results, any of the three lower-back positions (LBNA, LBA and LBF) can be used for effectively recruiting the UCPM and LSPM. However, extreme arching as identified by Algra (1) should be avoided. Algra (1) illustrated that extreme arching makes the lower region of the spine vulnerable to injury. For powerlifters, the HBP is a major lift that is required for competition. The main goal of powerlifters is to maximize the amount of load lifted for the HBP. However, during off-season, powerlifters employ different training techniques to peak for competition. They should improve their strength and power for every muscle involved in the HBP. Powerlifters can utilize the 50° or 70º GHJA with either lower-back positions of LBNA or LBF for developing pectoral strength in the off-season. As determined in this research the 50° (fatigue screen applied, N=9) and 70º GHJAs with respect to the 90° GHJA produces greater EMG activity in the anterior deltoid for the HBP. For bodybuilders, overall pectoral development, which includes muscle thickness and full muscle bellies, are important. Underdeveloped pectorals detract from the aesthetic look required for winning bodybuilding competitions. Overdeveloped shoulder muscles can detract from the overall size of the pectoralis major. Based on the findings of this study, bodybuilders can emphasize muscle fiber recruitment of the anterior deltoid by using the 50° or 70º GHJA. If anterior deltoid development is overpowering pectoral development, the 90º GHJA can be utilized with caution, when performing the HBP to de-emphasize muscle fiber recruitment of the anterior deltoid without affecting recruitment of the upper and lower pectoralis major. Only when every muscle fiber is maximally recruited, myostatin levels are temporarily decreased and muscle hypertrophy is induced (9). Depending on their goals, fitness enthusiasts can either employ similar techniques as bodybuilders or powerlifters. Some novice weight trainers experience discomfort in their lower-backs due to spinal disc compression when performing the HBP. The flat-back position can alleviate spinal disc compression. Although no “leg drive” was used for the LBF position, EMG activity of the prime movers of the HBP was not affected. Hence, the LBF position can be utilized effectively to recruit the UCPM and LSPM. It is proposed that benches should be designed to accommodate for the LBF and LBNA positions. Since scapular mobility had no effect on EMG activity of the prime movers of the HBP, it is recommended that bench surfaces be designed to allow for more scapulae mobility for possible prevention of shoulder injury. Further research is recommended in this area. 1. Algra, B. (1982). An in-depth analysis of the bench press. National Strength and Conditioning Journal. 3: 6-11. 2. Barnett, C., Kippers, V., & Turner, P. (1995). Effects of variation on the bench press exercise on the EMG activity of five shoulder muscles. Journal of Strength and Conditioning Research. 9: 222-227. 3. Bryant, J. (2013). Bench press: The Science. JoshStrength, LLC. 4. Butcher, J. D., Siekanowicz, A, & Pettrone, F. (1996). Pectoralis major rupture: Ensuring accurate diagnosis and effective rehabilitation. The Physician and Sportsmedicine. 24(3):37–42. 5. Cerna, M., A. Harvey, F. (2000). The fundamentals of FFT-based signal analysis and measurement. USA. National Instruments Corporation. 6. Christova, P., Kossev, A., Radicheva, N. (1998). Discharge rate of selected motor units in human biceps brachii at different muscle lengths. Journal of Electromyography and Kinesiology. 8: 287–294. 7. Cifrek, M., Medved, V., Tonkovic´, S., & Ostojic, S. (2009). Surface EMG based muscle fatigue evaluation in biomechanics. Clinical Biomechanics. 24: 327-340. 8. Clemons, J., & Aaron, C. (1997). Effect of grip width on the myoelectric activity of the prime movers in the bench press. Journal of Strength and Conditioning Research. 11: 82-87. 9. Colker, C.M. (2008). 3rd Ed. Extreme muscle enhancement. USA: ProSource Publications, LLC. 10. De Luca, C.J. (2002). Surface Electromyography: Detection and Recording. DelSys Inc.
11. Duffey, M. J., & Challis, J.H. (2007). Fatigue Effects on bar kinematics during the bench press. Journal of Strength and Conditioning Research. 21(2): 556-560. 12. Escamilla, R. F., Yamashiro, K., Paulos, L., & Andrews, J. R. (2009). Shoulder muscle activity and function in common shoulder rehabilitation exercises. Sports Medicine. 39(8): 663-685. 13. Fahey, T. D. (2010). Strength and Conditioning. USA. International Sports Sciences Association. 14. Fees, M., Decker, T., Snyder-Mackler, L., & Axe, M.J. (1998). Upper extremity weight-training modifications for the injured athlete: A clinical perspective. American Journal of Sports Medicine. 26: 732–742. 15. Fritz, T. (2004). 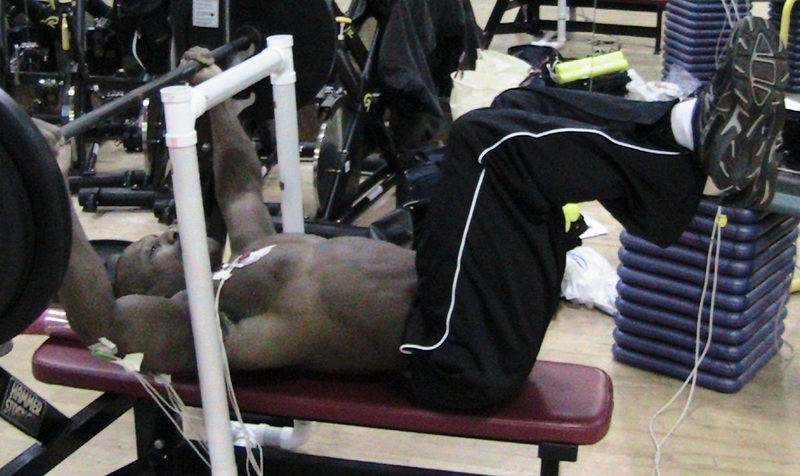 Elbow room: arm position determines muscle use on the bench press. Muscle and Fitness. 65(4): 60. 16. Glass, S.C., & Armstrong, T. (1997). Electromyographical activity of the pectorialis muscle during incline and decline bench press. Journal of Strength and Conditioning Research. 11: 163–167. 17. Green, C.M., & Comfort, P. (2007). The affect of grip width on bench press performance and risk of injury. Strength and Conditioning Journal. 5: 10-14. 18. Gross, M.L., Brenner, S. L., Esformes, I., & Sonzogni, J. J. (1993). Anterior shoulder instability in weight lifters. American Journal of Sports Medicine. 21:599–603. 19. Kazmaier, B. (1981). Bill Kazmaier and the Bench Press. Dynakaz. 20. Keogh, J. W. L., Hume, P. A., Pearson, S. N., & Mellow, P. (2007). 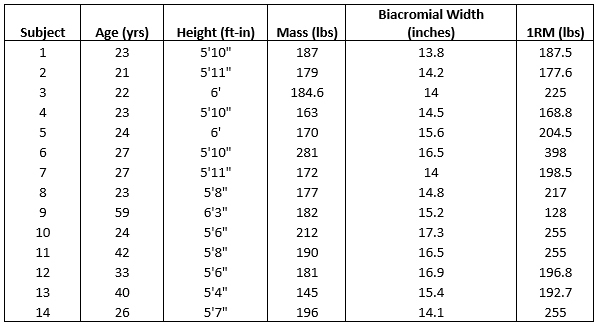 Anthropometric dimensions of male power lifters of varying body mass. Journal of Sports Sciences, 25(2): 1365-1376. 21. Larsen, U. (2008). Bench press: More harm than good. Sports Injury Bulletin. 80: 6-8. 22. Lehman, G.J. (2005). The influence of grip width and forearm pronation/supination on upper-body myoelectrical activity during the flat bench press. Journal of Strength and Conditioning Research. 19: 587–591. 23. McLaughlin, T. M., & Madsen, N. H. (1984). Bench press techniques of elite heavyweight powerlifters. National strength and Conditioning Association Journal. 44: 62-65. 24. Stephens, M., Wolin, P. M., Tarbet, J. A., & Alkhayarin, M. (2000). Osteolysis of the distal clavicle; readily detected and treated shoulder pain. The Physician and Sportsmedicine. 28(12):35–44. 25. Van Den Tillaar, R., & Ettema, G. (2009). A comparison of successful and unsuccessful attempts in maximal bench pressing. Medicine and Science in Sports and Exercise. 41(11): 2056-2063. 26. Welsh, E.A., Bird, M., & Mayhew, J.L. (2005). Electromyographic activity of the pectoralis major and anterior deltoid muscles during three upper body lifts. Journal of Strength and Conditioning Research. 19: 449–452. 27. Westerdal, M., & Tatar, B. (n.d.). 50 keys to a Bigger Raw Bench. Retrieved February 27, 2017, from http://www.fitstep.com/freebooks/other/50-keys-bigger-bench-press.pdf. 28. Wilson, G. J., Elliott, B. C., & Kerr, G. K. (1989). Bar Path and Force Profile Characteristics for Maximal and Submaximal Loads in the Bench Press. International Journal of Sport Biomechanics. 5: 390-402. Figure 3. Subject with legs lifted to produce the lower back flat (LBF) position. Figure 6. Mean %MmIEMG activity versus exercise position for the UCPM, LSPM, anterior deltoid and lateral head of triceps brachii of the HBP press for anisometric contractions.